Gum disease and decay is a common factor as you age. I am 35 now and I have noticed that things like drinking coffee daily has really begun to stain my teeth. That is why I was so excited to be offered the chance to try out Smile Brilliant Teeth Whitening System. I wanted a product that would whiten and brighten my teeth. I tell my children all the time that one of the first impressions you make is your smile. 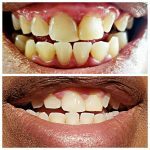 As a active part of my community I wanted to make sure my smile was beautiful so I began my at home teeth whitening from Smile Brilliant. There are so many whitening products out there. Some you wear overnight which is just not something I could do because I am a what if type person. Like what if I swallow it while I sleep or what if it falls out and makes a mess and I wake up sticky. With Smile Brilliant It took 60 min a day. You can wear up to 3 hours but I have the attention span of a squirrel so 60 min was it for me. After your teeth impressions are accepted they will send you your custom made teeth trays. Smile Brilliant offers the opportunity to whiten your teeth at home. It took a bit of trial and error on my part but after about a day it was easy peasy. I did have some gum irritation but once I tried the tips listed on Smile Brilliants site I was fine. I have a noticeable difference in the staining on my teeth. The hardest part was not drinking as much coffee so I wasn’t defeating the purpose. Keep in mind Smile Brilliant is not to strengthen teeth of repair. It takes away surface stains. My smile is brighter and whiter, and I could not be more pleased. Disclaimer: I was given a whitening kit in exchange for my review. All photos and opinions are my own.